There isn't much that strikes more horror in the hearts of homeowners than a flea infestation. And, when preparing to sell your home, the anxiety is doubled. Here's how to rid your home of those pests before the open house. If you're getting ready to sell your home (or even if you aren't), a flea infestation just won't do. 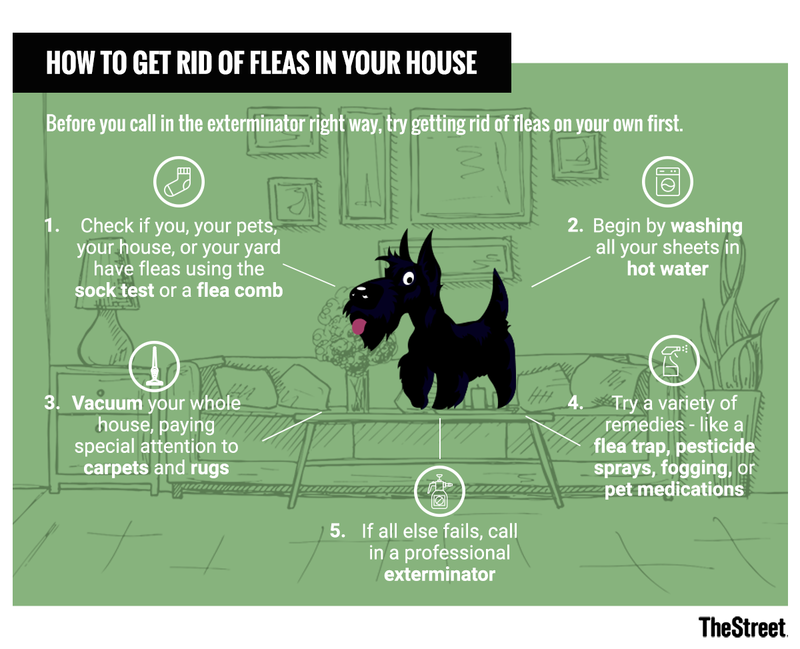 So, here is how to get rid of fleas in your house once and for all -- whether to impress potential buyers or simply regain your peace of mind. The first step to getting rid of fleas in your house is, well, to find out for sure if you have fleas. If you have a dog, they should be your first stop. Pesky fleas will make them uncomfortable and you even more so if it is not dealt with quickly. To find out if your furry friend has fleas, use a small flea comb. Start by combing your dog's head and ears, then move to the tail area and comb backwards quickly - fleas will run away from the comb, but if you're quick, you'll catch them in the comb. Having fleas is certainly not an ideal situation, and it can be extra frustrating if you've been spreading fleas in your own house without knowing it. The best test for finding out if you have fleas is what some call the 'sock test.' Don't worry, it's as simple as it sounds. Put on a pair of knee-high white socks and walk around your house, shuffling your feet to create heat (which those little guys are attracted to). Spend extra time in carpeted areas of your house or other places you think fleas might especially hang out. Nine times out of ten, fleas will cling to your socks as you pass by, showing up as little dark specks on the socks. This can be a little trickier, but there are a few telltale signs of a flea infestation that aren't too hard to spot. First, check for what is called flea dirt - to spare you the ugly details, it's basically flea droppings that show up as tiny blackish specs and usually smear a rusty red color. It can look kind of like black pepper. Another way to tell if you have fleas in your home is to look through the carpets for flea dirt or eggs (the eggs are tiny white specs). It helps to run your fingers through the carpet and see if you find either of these signs. You can also use a heat and water test to discover if you have pests in your pad. Since fleas are attracted to heat, you can set up a lamp, a bowl, some soap or detergent, and a bit of warm water. Set up the bowl under the lamp and wait for the fleas to come - they'll be attracted to the light and go toward it, and the soap will kill them once they fall in. Easy! Even if you found fleas in your house, don't forget to check your yard. To check if your yard has fleas, you can use the sock test outdoors too - paying special attention to shady areas like under porches, decks, and around trees or damp places. Don't forget to pay special attention to areas that your dog or pets may spend time, like dog houses or patios. First, make sure your dog has been using Frontline or some other flea and tick medication that helps dogs stay pest-free. If not, apply some Frontline (or medication of your choice) to your dog's neck (near the base of the head) directly on the skin (part the hair before you put it on). But, make sure not to give your puppy a bath too soon after applying the medication -- consult the directions before washing away the treatment. Some instant flea medications require application immediately and can get rid of fleas in around 6 hours (like Capstar Flea Killer). Even if you apply flea killing medication, make sure to comb your dog using a flea comb, soap, and water. The comb will get the fleas stuck into it and the soap kills them. You can also use flea tablets to make fleas go away on your pet within 30 minutes. You can feed the pill to your pet orally. However, it is not a long-term remedy, so keep that in mind. There are dozens of tested ways to get rid of fleas in your house. Unfortunately, you may just have to use trial and error until one sticks. The first thing you can do is wash all of your sheets in hot water. This will kill any fleas in or on them. You can also try using a flea trap (with a lamp, hot water, and detergent or soap). This exercise has been met with mixed reviews, however, so you might need more extreme measures. Flea sprays are a good option to getting rid of fleas on carpets, any fabric in your home, furniture, and even pets. Try using a strong spray that is made of natural ingredients to minimize the chemicals. Fogging your home is another good way to get rid of fleas and is frequently used by exterminators. The first thing to ensure you do is cover up all the food and dishes in your house, disable (temporarily) your fire alarms, and close the windows and doors. Then, shake your fog can thoroughly and spray. It is typically advisable to have one fogger for each room. Once you've determined that your yard has fleas, make sure you keep your dog or pets away from it until you have dealt with the problem (otherwise, you'll keep repeating the process!). You can use several different methods to get rid of fleas in your yard, including flooding it to kill flea eggs and new fleas from infesting. However, the safest methods to ensure your yard is good to go are to use pesticides. Spray your chosen product all around the yard (avoiding vegetables or flowers) and paying special attention to dog houses or kennels. If you're looking for a more natural solution, try using diatomaceous earth (DE) - a powder made from fossilized diatoms (algae). DE is a toxin-free substitute for many pesticides, and can be spread around your yard to kill fleas. While there are plenty of other remedies, these are perhaps the most common and most successful. Well, first -- don't. Make sure to use the above methods to ensure your house is flea-free. But, if you need to eradicate fleas quickly, target your efforts on the fastest methods, and bring in a professional exterminator if time is of the essence. So, before you put that open house sign in your yard, make sure there aren't any fleas living in it! Whether you opt to get down and dirty and rid your house of fleas yourself, or decide to call in pest control, make sure your home is completely flea-free before opening it to potential buyers. Replacing the carpet in your home is also another good option to ensure the next inhabitants of your home are starting with a clean, flea-free slate. While many people's first reaction might be to call pest control right away, it is a lot cheaper to try and remedy the infestation yourself first by using the above methods. However, if the problem still isn't going away, getting an exterminator is a good option. Pest control can take a few days and usually ranges upwards of $100 for treatment. But, when all else fails, call in the professionals.